Mediation Perspectives is a periodic blog entry that’s provided by the CSS’ Mediation Support Team and occasional guest authors. Each entry is designed to highlight the utility of mediation approaches in dealing with violent political conflicts. To keep up to date with the Mediation Support Team, you can sign up to their newsletter here. The challenge of how to deal with armed groups after a conflict ends is one of the many problems facing mediators and negotiators working toward a peace agreement. Such arrangements are critical because mistrust between armed opponents, the challenge of restoring state authority, and the hazards of peace process derailment are not easily overcome. Disarmament, Demobilization, and Reintegration (DDR) programs, which attempt to shepherd former combatants into peacetime civilian roles, are one approach. However, DDR rarely provides channels for former combatants to enter the government’s security forces. Instead, this is the focus of the subject of this blog, military integration initiatives. Military integration is a common feature of peace settlements and is distinct from DDR, although it can follow the process of disarmament. Military integration initiatives aim to keep wartime combatants mobilized under the aegis of the state’s security forces, through mechanisms in which the government integrates rebel forces, or the two opposing sides are merged, into a single national force. There are many challenges to successful military integration. The lack of inter-group trust may be primary. Political and military leaders may be concerned that social or ethnic divisions exacerbated by conflict could undermine the cohesion of integrated security forces. In addition, the government needs to balance the recruitment of any particularly well-educated rebels into leadership roles with the recruitment of rank and file soldiers with very low capacities. Many post-conflict states lack the budgetary resources to pay their own security forces, much less to expand their military to admit their former enemies. Finally, even if the government is able to recruit significant numbers of former rebels, it will still face the dilemma of how to employ them in support of a post-conflict military mission. Despite these challenges, successes do occur. Florence Gaub points to the case of Lebanon throughout the 1980s, when the multiethnic army highlighted the potential for an ethnically-integrated national military to remain cohesive in the midst of a civil war. Furthermore, evidence from Burundi shows the value of the ethnic integration of security forces in strengthening security and reducing ethnic tensions, not just within the military but also potentially in the post-conflict country as a whole. One reason why military integration processes may be effective is because they are a way of fostering engagement between conflict parties. Facilitating contact and cooperation between former belligerents (including military leaders) is vital for building and sustaining mutual trust and making progress toward settlements. Jeremy Brickhill highlights the importance of military-to-military cooperation in negotiating the security arrangements associated with peace processes. In this regard, negotiations over the eventual integration of armed forces into the national security sector can be one avenue to achieve the close involvement of military representatives, thereby building trust between (former) enemies. Moreover, military integration can help mitigate the risk of spoiling behavior. Actors in the post-conflict environment may have interests in the war economy, concerns about the unfair distribution of political power and resources, and challenges in adapting to peacetime social and economic structures. These characteristics can lead to peace processes derailing, but they are also demands that can be partially met by the successful integration of armed elements into national security forces. 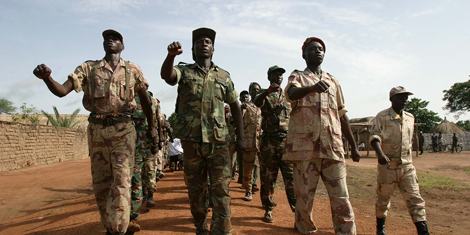 In South Sudan, for example, before and after independence, the Sudan People’s Liberation Army allowed personnel from armed groups to enlist in the country’s national security forces. Lesley Anne Warner believes that, for a time, these arrangements were critical in preventing civil war in South Sudan. When internal conflict did arise, it was partially a consequence of the imperfect implementation of military integration, which in turn may have resulted in part from the failure of international assistance to address and support it. The negative trajectory of security in South Sudan shows that military integration is not a complete solution. Rather, its contribution to peace is strongly shaped by political developments and resource requirements, reflecting the broader context of peace processes. Despite the challenges, the promising examples that do exist show that there is potential in military integration. Alternatives to the post-conflict integration of former military opponents — like the geographic separation of opposing armed forces, or attempts to disarm all non-state combatants and to incorporate them into civilian society — have their own sets of challenges. More rigorous analysis of the challenges, benefits, and legacies of military integration would help to guide negotiators and mediators. Ultimately, however, this is another tool that, if carried out in a technically-sound manner and if combined with political will, can help facilitate peace agreements and sustain peace over time. Josh Jorgensen is a Political Science graduate student at Columbia University with a Masters degree in international security policy and conflict resolution from the School of International and Public Affairs. He is a United States Army veteran and recently completed an internship in the UN Department of Peacekeeping Operations.